(NT 58902117) Barnhills Castle (NR) (In Ruins). Barnhills Castle. This oblong 16th-century tower, now reduced to its lowest storey, stands at the S extremity of the parish on the high left bank of Craigend Burn. It measures 34ft 3 in from N to S by 24ft 9 in from E to W over walls averaging 4ft 8 in in thickness and rising to a maximum height of 17ft The walls are built of rubble masonry, mostly of freestone, and the remaining windows have chamfered freestone dressings. A rough opening in the E wall indicates the position of the entrance, and beyond this three steps lead down to the ground floor; on the left of the entrance can be traced the remains of a short straight flight of steps running southwards within the thickness of the wall to the SE angle, where a newel staircase has risen to the upper floors. The ground floor is a single barrel-vaulted compartment, the N half of its vault still being complete. It has been lit mainly from two small windows, facing W, which rise upwards through the haunch of the vault, the tops of their breasts being stepped to admit the maximum of light. Between these windows is a gun-loop, and each gable contains another. The remains of the floor above are scanty and inaccessible. The fabric was repaired some years ago, but since then has become overgrown with vegetation. RCAHMS confirmed. Photography not possible. 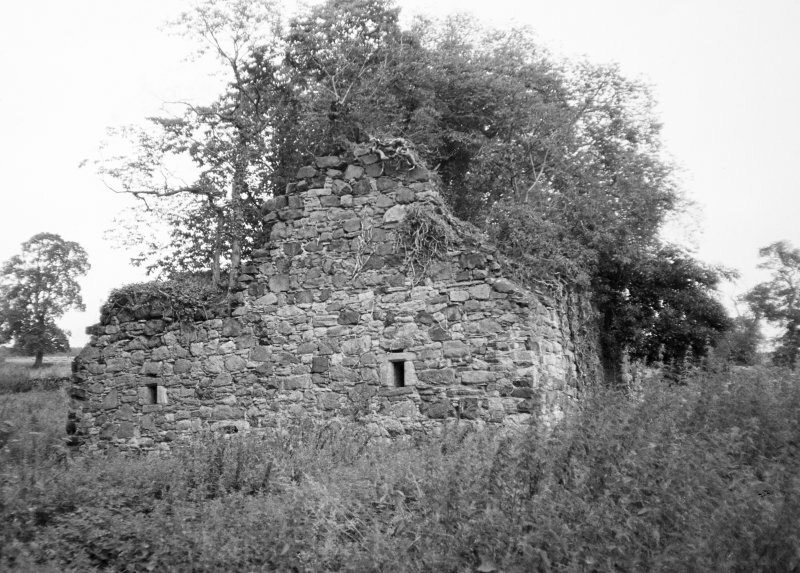 The remains of this tower-house are as described by RCAHMS, although some of the features then noted are now obscured by rank vegetation. Visited by RCAHMS (RM/JRS) 29 September 1993.